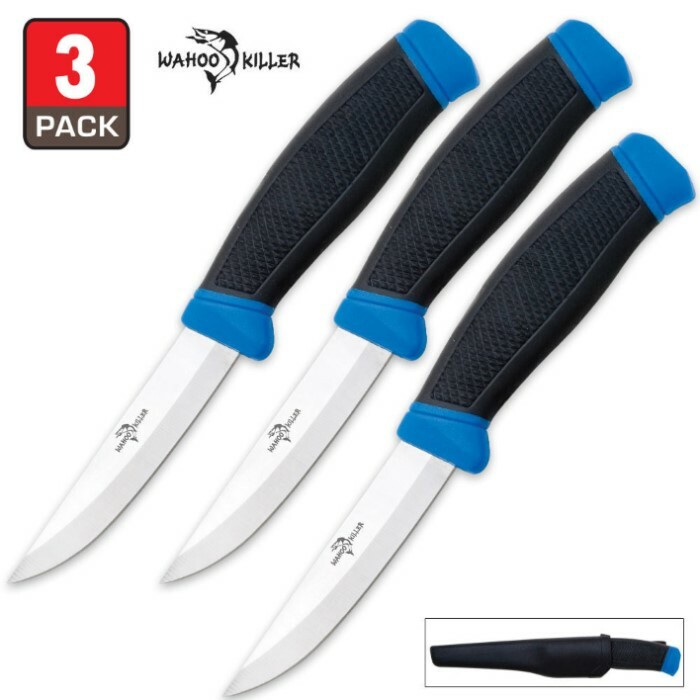 BKCK125 | BUDK.com - Knives & Swords At The Lowest Prices! You’ve been asking for it, so here it is–a triple pack of our best selling knives! I have bought 19 of these knives. I have one in every vehicle I own and several in the home. I also have given many away as gifts. Most people's response is a simple thanks until they use them. They find them extremely comfortable to use and ask me where I bought them as they want more. Great product for the price! I use them for everything from removing net wrap from bay bales to removing splinters from my fingers. Most have come sharp, however a few minutes on a stone and you can shave no problem. Holds an edge well. I use them daily and highly recommend them. The "Dont Trend in Me" model is my favorite and hope you make more. Just received a shipment of 6. Pretty cool. We'll see how they hold up. The handles are the newer style with the grooves, not the diamond checkered ones in the picture. Very grippy. Might be a bit harder to clean if you get gunk all in the grooves but it won't slip. For $1.67 each ... Wow! Not as long as the 88 cent Walmart chef knife, but thicker. But these are Wahoo Killers, not tomato killers. These knives are great buys . Very good knives to keep in kitchen ,car, backpack just about anywhere you may need a knife . You will not find a better knife at this price .I buy them when I need to fill out an order . Gave one to my mother she loves it . 100 % satisfied .Buy one see for yourself . WE fish all the time so we needed new knives. I saw the price so I thought I would try them out. Works great easy to clean and they were shipped fast. Best knife I have ever bought for the money with very good quality. So...one of the knives wasn't ground all the way to the tip, but easy fix. I still give this 5 stars for the excellent value and quality of build. Overall a great utility knife. I bought a three pack and am buying a few more for glovebox, tacklebox, backpack toolbox etc...! i bought these thinking would be a good way to maybe get my family on board with prepping and would be a useful bit of gear should anything happen or even if they need to cut a bit of rope or something. I was worried about the knives there self for the price but i am not disappointed and neither was my family they couldn't believe the price i paid for them. They do remind me a bit of a mora knife which i have owned and gave away to my Ex GF for her Bug Out Bag. Well worth the money. Not a bad knife for a couple bucks. Fairly sharp but rough edge on them from the factory, looks done by hand on a belt sander, cleans up pretty easily. I bought six of them, and I am not disappointed, but I am not ecstatic about them either. Good knife to throw in a glove or tool box, but a substantial step down from a Mora.